See, I shall send to you EyleeYah the prophet at the face of the coming great and terrible day of YHWH. And he shall turn the heart of fathers unto sons, and the heart of sons unto their fathers, lest I come, and strike the earth [with] a curse! This pledge to send the prophet cannot be underplayed. Elijah was taken into the heavens by a whirlwind during the 9th century BC, and Malachi the prophet was writing near the beginning of the 6th century BC / end of the 5th century. Nobody would have expected the return of the great prophet of repentance after the passing of several centuries, so this declaration carried an unparalleled expectancy for the people. The coming of Elijah would be no small matter, but would certainly herald the redemption of all the tribes of Israel, lest destruction come upon them. For the believer in the Messiah Yeshua, the return of Elijah is linked directly to the prophet John, known popularly as John the Baptizer, who would turn the hearts of sons to their fathers, and vice versa. In Luke 1:16-17 John was prophesied to minister in the spirit of Elijah in the message given by the angel Gabriel to Zacharias, John’s father. The angel explicitly explains that John would minister in a unique manner: although he was from the tribe of Levi and would be a priest of the Most High, his ministering would not follow that of his father, Zacharias, but rather, parallel the very public and controversial ministry of the ancient prophet, Elijah. This task would have him directly involved in the prophecy from Malachi, to turn the hearts of fathers to sons, in order to bring about a people for the Holy One. He would be ordained to minister in the Spirit of Elijah – that is, the authority from heaven Elijah possessed would be upon him to bring repentance to Israel. The Aramaic text of Matthew here records Yeshua using the term M’SHADAR “sending” to speak of the divine ordination of John’s ministry. In the Aramaic Peshitta translation of Malachi 3:1 and 4:5 (3:1 and 3:23, respectively, in the Hebrew text), the word “send” is also M’SHADAR. The synchronicity of the concepts is thus meant to establish for the ancient reader (who likely read it in the Aramaic versions of the Tanakh [Old Testament]) that John was indeed linked to Elijah’s ministry, and thus, the fulfillment of the prophecy. The testimony of Yeshua is that John fulfilled the necessary role of Elijah coming to do a powerful work of repentance. This is not to say that the actual person of Elijah himself shall not one day appear, for so Yeshua seems to strongly reference such an event taking place at some future date in time (see Matthew 17:11). His words strongly support the future appearance of the prophet. What it does, however, is show us that for the first coming of the Messiah, the ministry of Elijah was certainly rekindled by the unique priestly function of John the baptizer, who would serve the Holy One in the same Spirit and power as the ancient prophet. In all of this, however, we must consider the viewpoint of Judaism concerning the prophecy in Malachi, for while it may at first glance seem divergent to that of the Messianic accounts recorded for us, it actually proves to weave itself back into those very accounts. How this is so shall be seen shortly. The traditional Jewish perception of Elijah that they hold is one that is far freer in terms of his ability to interact with mankind. There are many accounts in traditional Orthodox Jewish writings that would have one believe the prophet of repentance pops back to earth repeatedly to interact with the Jewish people for all kinds of reasons. While that concept is one to take with a grain of salt, as it is not one that is readily upheld by the testimony of Scripture, they do have one particular perception concerning the prophet that warrants some serious attention. While Judaism may have traditional anecdotal accounts of Elijah appearing here or there in history for a particular purpose for the Jewish people, they actually hold the belief that he will return finally in power and to herald the redemption of the people of Israel that is found with the coming of the Messiah. The precise date of that event is not specifically laid forth in this mindset, but the belief is held that he should definitely come during the performance of a Passover memorial meal. How this view came to be held is of importance to us today as believers in the Messiah Yeshua, and must be addressed. The four cups are thus meant to parallel the declarations of His commitment to the covenant He made with the patriarchs. They are cups of remembrance that the rescue of the Hebrew people from the land of Egypt was based on His faithfulness, and not the merit of the people before Him. It is a beautiful method to recall His astounding mercies to us – He saves when we cannot save ourselves. He does the work that we cannot do. While the four portions of wine are not a Scripturally-commanded part of the actual Passover memorial service, they developed among the Israelites of old as a way to commemorate the faithfulness they perceived in the covenant words of Exodus 6. Near the very end of the Passover seder, a fifth cup is poured. This cup is not poured by everyone, and neither is it to be consumed. 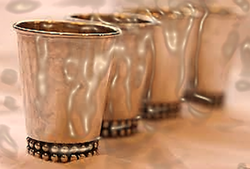 Rather, it has become known as “Elijah’s cup.” The reason for this designation, so tradition goes, involves a dispute among the rabbis concerning how many cups of wine are to be drunk during the course of the meal. 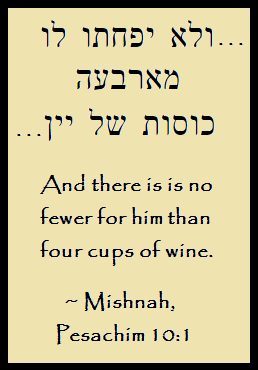 Based on the four declarations mentioned above from Exodus 6, the ancient Jewish writing called the Mishnah tells us that four cups of wine were to be consumed. This is echoed also in the more expansive ancient Jewish work called the Talmud. In it, we read that four cups were imposed upon each attendee. However, there is another opinion to be considered. 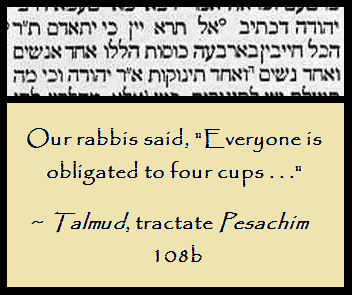 In five ancient texts of the Talmud, an alternate reading is found there, where the number “four” is changed to “five.” In those texts, it is incumbent upon the attendee of a Passover seder to drink five cups of wine – not four. This reading is supported also by a handful of highly-regarded Jewish sages throughout history. The idea for there being a fifth cup in the seder is proposed to have been alluded to from the very next verse of Exodus 6 in the text of the declarations of what the Holy One would do for Israel. In Exodus 6:6-7, we saw that He would perform four deeds for Israel, and those four deeds are commemorated in the four cups of wine. In Exodus 6:8, a final deed is mentioned, and it is in that fifth deed that the fifth cup of wine is argued to be necessary. And I will bring you unto the land which I swore by My hand to give it to Avraham, to Yeetzkhaq, and to Yaaqov, and I shall give it to you [for] an inheritance. I am YHWH. The declaration made here is VEHEYVEYTI – “And I shall bring you.” It is viably the fifth statement of what the Most High would do for Israel, as it follows in the train of thought from the previous verses. However, since the majority of texts and opinion lay with the concept of four portions of wine, the debate stood unresolved with it being incumbent upon all to definitely drink four cups, and to just pour a fifth cup that is not to be drank. The fifth cup is instead poured into a glass out of respect for the opinion of the rabbis who saw the legitimacy of the fifth declaration. It may be viewed as just another rabbinic method of resolving a dispute over tradition, but it cannot be entirely relegated to such a debacle. The reason being for the significance of the issue is that the link they have established between the cups of wine on Passover and the appearance of Elijah the prophet may very well have its prophetic establishment first in the text of the New Covenant writings of the Messiah! That’s right; there are details in the New Covenant texts of the Gospels that could very well give precedence to the Jewish view of the appearance of Elijah at the Passover and the fifth cup that is refrained from being consumed until his eventual appearance. Our attention must turn to the crucifixion account and the Passover details preserved for us in the Gospel texts. 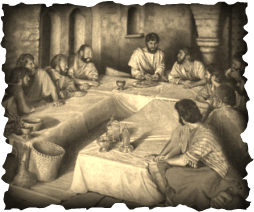 All four of the Gospel accounts make mention of the Messiah and His disciples partaking of the Passover meal hours before His crucifixion. ​We see the disciples preparing the Passover itself (another word for the lamb that was slain and eaten); a surprise act of the washing of feet (only hands are ritualistically washed at a rabbinic seder); reclining while eating (an action taken specifically at a seder meal); the breaking of bread (the thin unleavened bread is intentionally broken during the seder); the dipping of the bread into something else (not described as to what in the NT, but significant in that unleavened bread is dipped into a special sauce during a seder); the singing of a song at the close of the meal (a specific Psalm is sung at the completion of the seder, known as the Hallel); the cup of wine is blessed after the meal (this is exactly the order done in the seder – and is the third cup drank). The third cup of wine corresponds to the third declaration made by the Most High to Israel through Moses: VEGA’ALTI – “I shall redeem you.” It was over this cup that Messiah made the special significance of viewing it symbolically as His blood. The context of His words precisely identifies it with the third cup of the seder meal, as we see in Luke 22:20, as well as Matthew 26:27-28. Messiah refrained from drinking the fourth cup of wine during His Passover seder, which corresponds to the declaration of “taking” the people to Himself (see Mark 14:25). His purpose was for redemption; “taking” us to Him is left for the marriage ceremony that is yet to come. Thus did end His final Passover on earth before His death. However, just because the seder was complete does not mean that the prophetic significance was finished. The Spirit that “Elijah” (John) had ministered in was still moving in the earth, and the result would culminate in a beautiful end result despite the horror that was to come. The situation surrounding the crucifixion of the Messiah is brimming with significance. Every movement and word recorded for us overflows with astounding spiritual value. As terrible of an event as it was, there is in it so much which we can glean for our appreciation of His act of redemption. Regarding the topic of this study, there are some important events that take place during the crucifixion that need to be brought up so we can see how Judaism’s view concerning the return of Elijah finds its beginnings in the New Covenant writings. The first detail is recorded for us in Matthew 27:33-34. This detail is mentioned a second time in Mark 15:23. And they gave to Him to drink wine that was mixed with myrrh; but he did not receive [it]. What is the relevance of this event? Think about the previous details mentioned in this study concerning the Passover seder Messiah experienced with His disciples, and how we see Him blessing the third cup, but intentionally not partaking of the fourth (see Mark 14:25). He finished His Passover memorial, but it was on the cross, in great pain and agony, that a fourth portion of wine was offered to Him! This offering of wine mixed with a bittering agent (revealed in Mark to have been myrrh) played the role of the cup from which He had so recently refused to drink! These are not arbitrary details, but are nuances in the text leading us to a beautiful spiritual event that takes place on the cross. The next detail that follows begins to make sense of the practice in Judaism of bringing Elijah into the memorial of the Passover. We read in Matthew 27:46-49 a very interesting turn of events. This passage is very difficult to read. Messiah’s agony was real. He offered a sincere question to the One whom He could always count on to listen, and despite the brief moment of compassion from one person in the crowd, He was met with further derision by the masses who watched Him suffer. While there are several points to note in this passage, the first of importance to our study is the interesting observation by the onlookers after Messiah cries out to the Holy One. They make the odd statement that Yeshua was calling for Elijah. This spurs one from among them to offer Him wine for a second time while on the cross, and yet the question must be answered: why did they think He was calling for Elijah? The answer lay in a detail of the question Yeshua uttered on the cross. He was not speaking Greek, but Aramaic, and in that language alone is found the answer to why they assumed He called for Elijah. The above verse is translated straight from the Aramaic text of Matthew, and the Peshitta text there does not contain an explanation that was included when it was translated into Greek, which might give a clue to the reader of a Greek-based English translation of the text. However, the clue is also found in the Aramaic text of Mark 15:34-36 (from whence it was likely later inserted also into the Matthew passage when it was translated into Greek for clarity for the reader), where Mark took it upon himself to not only include the exact words spoken, but also to explain the words Messiah uttered in a more understandable Aramaic transmission for his readers. In the translation from that Aramaic above, I have given the initial actual question from Messiah (the exact same as found in Matthew previously) in transliterated Aramaic phonetics, as is typically found in Greek translations of that text, in order for the reader to see the detail of what was happening that brought about the thought to the bystanders that Messiah called for Elijah. The word used by Yeshua for “Deity” here in the Aramaic text is pronounced EEL, and is an Aramaicized form of the Hebrew EL, which means “Deity.” The confusion came to some of those standing around the gruesome scene when they heard the obviously pain-racked and garbled voice of the Messiah, being likely faint from blood loss and gasping each word from His self-imposed dying process of positional asphyxiation (see my study A LIFE LAID DOWN for the shocking truth of how Messiah actually died). The word He uttered: “EEL,” taken in the context of His diminishing physical condition, and perhaps also amidst the jeering taunts of the heartless that were passing by, made those standing nearby instead hear the name of the prophet in the familiar Aramaic pronunciation of EELEEYA. Mistaking a gasping, sputtering, dying man’s word of “EEL” for the name “EELEEYA” is entirely logical, given the wider context of the situation. The exhausted exhalation at the end of EEL would very likely have sounded like the ending phonetics of EELEEYA. Some may also question the reason for Mark’s explanation of the expression of EEL if it is already an Aramaic term. The answer is that Mark felt the need to clarify the question uttered by Yeshua due to the fact that vowel-pointings were not present when the Aramaic was originally written, and the term EEL, being meant as an Aramaicized version of the Hebraic EL (“Deity”), is spelled exactly the same in Aramaic as the word AYAL, which means “Help!” The typical Aramaic reader could easily have misunderstood the intent of Messiah’s cry, and instead of the concept of Deity, would have thought He was merely crying for help and asking why the prophet Elijah had forsaken Him by not coming. His cry was not to man, but to the Father. Mark did not want the reader to mistake the Addressee of that very important question, and so, in his clarification, went on to use the widely-recognized Aramaic form of ALAHI (“My Deity”) to translate the possibly-misconstrued term of EEL for any Aramaic reader, while leaving the rest of the question exactly as it was originally uttered by Yeshua. Why is this detail worthy of noting in our current topic? It is significant because it makes it clear that Messiah was calling out precisely to the Father, and yet some of those around Him believed Him to be calling out to Elijah – so much so that a fifth portion of wine appears in the text immediately after Elijah is mentioned by the onlookers. This corresponds to the fifth cup – Elijah’s cup – the questioned cup the rabbis could not decide upon whether to drink or not, the debate over which Elijah is believed to finally settle upon his eventual coming. We see that while He abstained from taking a fourth cup at His Passover meal, and refused it when a fourth portion of wine was offered to Him earlier on the cross, He did accept this fifth offering of wine during the Passover timeframe. This would correspond to the fifth cup – the “cup of Elijah,” in that this is the event where they believed Him to be calling out to the prophet – thinking He felt betrayed that the prophet had not come. It was as if the cup had been made ready, but no prophet arrived. However, the text tells us that Messiah actually drank from the wine offered to Him this second time on the cross if we turn to the parallel account of John 19:30. Yet, when He had taken the vinegar-wine, Yeshua said, “Behold! It is complete!” And He lowered His head, and delivered [over] His Spirit. ﻿The Holy One allowed the bystanders to think they heard the name of Elijah in the struggled cry of Yeshua in order for us to be able to see the deeper reality at work – while the prophet was not being called upon, the prophesied work of the prophet was being completed, and the misheard statement draws our attention to that fact. He drank from the fifth portion of wine offered, and gave up His Spirit. While the detail is interesting to consider that He drank of the wine, it should also draw our attention to what was actually happening with the question He gasped on the cross: His heart was turned directly to the Father. 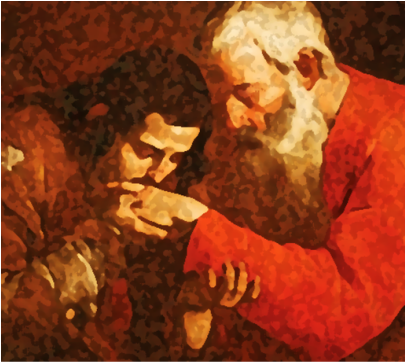 He asked a pain-stricken and honest question to the Holy One, and it was up to the Holy One to respond. When we look a little deeper at the nuance of Messiah’s question, we can see that a response came not long after it was uttered. The Aramaic term He uttered that almost all translations render as “forsaken” is SH’WAQTANEE in the Eastern Aramaic dialect. It stems from the root of SHABAQ, and has the general definition of “forsake / leave.” It also holds a secondary usage of “spare / left.” The question that leaves the lips of Yeshua is thus one that carries a dual meaning that works in both ways when viewed in light of His circumstances. If viewed in the context of Psalm 22, the choice of “forsaken” identifies Him with the prophetic weight of the Tanakh. But, if it is viewed in regards to the intensity and nature of His suffering, then the choice of “spared / left” aligns with Him asking for mercy from the Father to finish what has been started. It is a request that the end come quickly. He has done all He was sent to do. Blood has been poured out. It can rightly be viewed as “…for what have You abandoned Me?” and / or “…for what have You spared Me?” In the translations I have made from the above verses of Matthew and Mark, I chose the term “left” because I felt it aptly conveyed both ideas in that singular English word, depending on how one wanted to view its dual meaning. But Yeshua, He again cried with a loud voice, and His Spirit left. But Yeshua, He cried with a loud voice, and was delivered [over]. These passages bring some further insight into His death when we consider that although neither shares what He cried out at the end, those words He actually spoke are recorded in John 19:30, as given above: “It is complete!” He had turned His heart to the Father, and the Father turned His heart to the Son and let Him expire to end the suffering sooner than physically should have happened. He uttered a beautiful final expression in His own language that is largely missed when reading English translations. The Aramaic presents the exclamation that is rich in meaning: “M’SHALAM!” The context gives us the definition of the phrase as “It is complete / full.” The word from which it arises is SHALAM, and means a totality, a fullness, a completeness, and from it comes the popular greeting of “Shalom / Peace.” Yeshua could shout out in triumph “M’SHALAM!” because He had procured peace and fullness for His people. There would be no destruction, no curse upon the land. Because of His turning to the Father, and the Father turning to Him, there would only be peace on the earth. M’SHALAM! The Spirit of Elijah thus can be viewed at the crucifixion in a unique way. If the hearts were not turned, so says Malachi, the earth would be struck with utter destruction. Messiah turned to the Father on the cross, and the Father turned to the Son on the cross, and the world was spared.